"Dysplomacy!" - Wisdom is the retention of innocence through adversity. Why are we rushing headlong into Syria and possibly WW3? Because a vast military-industrial establishment, and its political-financial-intelligence wing referred to as the deep state, has succeeded in hamstringing Trump, and at pushing in two of its agents, in order to advance the causes of MILITARY SPENDING and of economic conquest over Russia and its sphere of influence. These to are Mike Pompeo, former CIA head, now SECRETARY OF STATE; and John Bolton as director of the nefarious NSA (National Security Agency). In the past, Pompeo is a Neo-Con who has sought regime changes in Iran and N.Korea. Bolton was a founding member of the GOP 'PNAC', responsible for the militant Neocon course we are on today. (Please search 'PNAC', and/or, 'PNAC and the end of the world'). Both the Bush administration and Hillary Clinton and the Establishment Dems have merged into this Neo-Con / Neo-Liberal conspiracy, which is now in control again). "There’s no one like someone who understands the value of dysplomacy and the terror and tragedy that is war like someone who has served in uniform,” said Pompeo, who served in the Army and is a graduate of West Point. 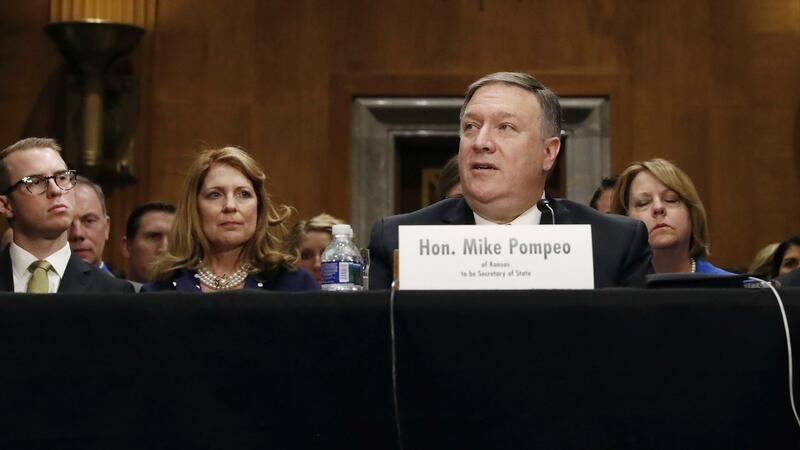 "The Pompeo I hear today...[is] much more different than some of the Pompeo of the past," said Sen. Bob Menendez, D-N.J., in closing remarks as the panel's ranking member. "And so I'm trying to figure out which is the one who’s going to act if he gets confirmed as the secretary of state because some of these things of the past, I could never support. Some of the things you’ve said here today I could actually be supportive of." Sen. Bob Corker, R-Tenn., chairman of the committee, said that he plans to "avidly support your nomination and confirmation." An American human rights lawyer said the recent appointments by US President Donald Trump of Mike Pompeo as Secretary of State and John Bolton as National Security Adviser clearly indicate that Washington wants more war. “Donald Trump’s recent changes in his foreign policy team is quite worrying for the prospects of world peace and security. Most notably, the naming of John Bolton, an avowed neo-Con, as National Security Adviser signals that the US is poised to launch new wars on possibly a number of fronts, including Iran, North Korea and/or Venezuela…,” Daniel Kovalik told the Tasnim News Agency. 1 - The latest crisis w/ Korea set the stage for this, and ramped up Trump's militant posturing. 2 - The bogus Russiagate investigation, which has transmogrified into th maelstrom, which has spawned additional accusations as well as an unethical FBI raid on the office, home and person of Donald Trump's personal lawyer, Michael Cohen, as well as behind-the-scenes ultimatums, have forced Donald Trump into obliging the insatiable hunger of the Deep State to wage war, bully Russia, and make money. Trump's recent hirings look to be coerced. His latest tweet threatening Russia even appears to be by someone other than Trump! 5 - I am convinced that both the spy poisoning in the UK and the Syria 'gas attack' are concoctions, fabrications, false flags to further a Western assault on Russia, Ukraine, Syria, Iran and more - mainly to profit the rich. I hope to be writing more about these things ASAP. I have been terribly ill this month. By jumping to conclusions about the alleged chemical weapons attack in Syria, Donald Trump’s war cabinet and their media cheerleaders are recklessly pushing us closer to a military confrontation between Russia and the United States. The situation is dire and we may well be closer to an all-out war than most are willing to admit. This is real. It’s happening. And we could be hours away from an event horizon, the result of which could be devastating. On tonight’s show, Clyde Lewis talks about ENDLESS TOMORROW – THE NUCLEAR CONCLUSION. Outgoing CIA Director Mike Pompeo revealed the US had already killed hundreds of Russians in Syria, likely Russian mercenaries working with the Assad government, back in February. “In Syria, a handful of weeks ago, the Russians met their match and a couple hundred Russians were killed,” Pompeo said during a Senate hearing on his nomination to become US secretary of state. The U.S. military is in the business of conquest, death, and destruction, not "humanitarian intervention. French President and US vassal, Emmanuel Macron, claims he has concrete evidence the Syrian government allegedly used chemical weapons in the Syrian city of Douma. Macron is mulling over his own decision to strike Syria, promising to make a decision on whether or not to strike ‘when the time comes’, and promised that Paris would not allow for an “escalation” to take place in the region. Russia-24 (Россия-24), a state-owned Russian-language news channel from Moscow, spent five minutes on Tuesday advising its viewers how to prepare for a nuclear war amid the increasing tensions with the United States over Syria. The television anchor urged the country’s citizens to purchase essential items and emergency supplies to stock their bomb shelters. The US and its allies are preparing to attack the Syrian government. There are severe dangers this could mean a direct fight between the US and Russia. That’s just the tip of a very big iceberg in Syria, however, where the number of potential wars about to break out is growing by the minute. The risk of belligerence between US and Russian forces is very high when the fighting turns to the Syrian government. Russia might shoot down an attacking US warplane, or US planes might attack Russian forces on the ground. Even unintentional targetings are a risk, given America’s notorious targeting struggles. After all, the US air campaigns in the region have frequent friendly fire incidents associated with them, with the benefit of accurate troop data they won’t have on the Russian positions. U.S. President Donald Trump’s homeland security adviser, Tom Bossert, has resigned at the request of new national security adviser John Bolton, an administration official said on Tuesday, marking the latest departure from the White House of a senior adviser.